This amazing lady turns 98 today! Elizabeth Thayer Haller, born September 20, 1916. 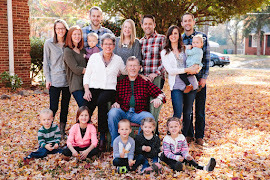 She is dear to our family: everyone loves "Aunt Lib," "Grandma,"
She counts 2 sons, 6 grandchildren, and 12 great-grandchildren! Elizabeth has lived in assisted living for five years. In the past year she's slowed down a lot and her memory is failing her. It's very hard to see. But today she'll have visitors and cupcakes on her special day. And, I hope, feel the love that she's given for so many years. Limping along a little bit late, but here ya go. Three-plus weeks ago, all five of our grandchildren (and their parents, yah) drove many, many miles to Ohio to visit us for the weekend. Such great, loud fun! We have just a few more months that we can say "five under five!" Someone asked me what we would "do" with the grandchildren during their visit. That pretty much summed up the weekend! "I do NOT need your help blowing out my candle, cousins!" asking their reason for coming to Dairy Depot. Ha ha! In 15 years they'll both have their licenses! Gah! I got to take a little dip in our neighbors' pool with the girls. Thanks, Exlines! I sent home some toys with both families, including LEGOS. Everyone's happy! It took nearly 40 shots to get this one, which is my favorite. Whew! My brother Pat called one year ago this morning. "He's gone," he choked out. We knew it was coming, we actually prayed for Dad's release from his prison of dementia. Still, it was a hard, hard day. An emotional week followed: getting to Nashville, all our kids and my siblings and their kids, the service in Nashville and burial in Memphis, and an 11-hour drive straight back to Ohio. The comfort of my stepmother Sally and her family was wonderful. In the past year I got a new job. Made trips to see grandchildren. Moved Katie to Florida and was stunned by the sudden death of dear friend Pat. We made three trips to our cabin (for sale) in northern Michigan. Bill's still dealing with significant back pain. His mom, Elizabeth, is almost 98 and growing more frail. Life goes on and there seemed to be more challenges over the past year. But God is faithful and I choose joy: joy in seeing my children strong and independent. Joy in a loving and supportive husband. Joy in the truth that God is always good, his ways and timing perfect. Joy in the memories of having had two parents on this earth whose presence is missed but whose teachings I hold close. Life isn't always what we want or hope, nor can I demand to always be "happy." But I can choose joy, seek peace and practice contentment. ... I have learned to be content whatever the circumstances. Ethan Henry Haller turns one today! I'm smitten with his boyish cuteness. visiting us, along with sister Lily and his three Haller cousins. to crawl right through it! and a ravenous eater, like his dad. I'm so blessed by this second grandson. Happy, happy birthday, Ethan. And a hundred more! Where has all the blogging gone?? It's been a full, hectic, somewhat stressful summer. And then I don't write much. But I hope to change that and get back on track, beginning today, the first day of September and my mother's birthday. Not to cheat or anything, well maybe I am. But I'm borrowing a past birthday post. I don't know, it seems I've entered a new phase of life the past year. Both my parents are gone. (Though I am very thankful for my stepmother, Sally.) I appreciate the impact my parents made on my life but I don't dwell on it and life goes on. This photo of my mother was taken around 1950, when she became engaged to Dad. It's a sweet photo of the young bride-to-be but goodness, so long ago. Isn't life short? And sometimes I think, is it even possible to love someone who's been gone for so long? In a sense it's like I never knew her. Hey, Mom. Today you would have turned 89 years old. It's hard to imagine you that old, because when you left us, you were younger than I am now. I still miss you. How I would love to call you (or email!) and share something about the kids. You would be so proud of David, Dan, Mark and Katie, and Jenny and Jill, too. You would have built tender relationships with them. You were such a warm and relational person. You always looked forward to grandchildren and now I know why, with five of my own. 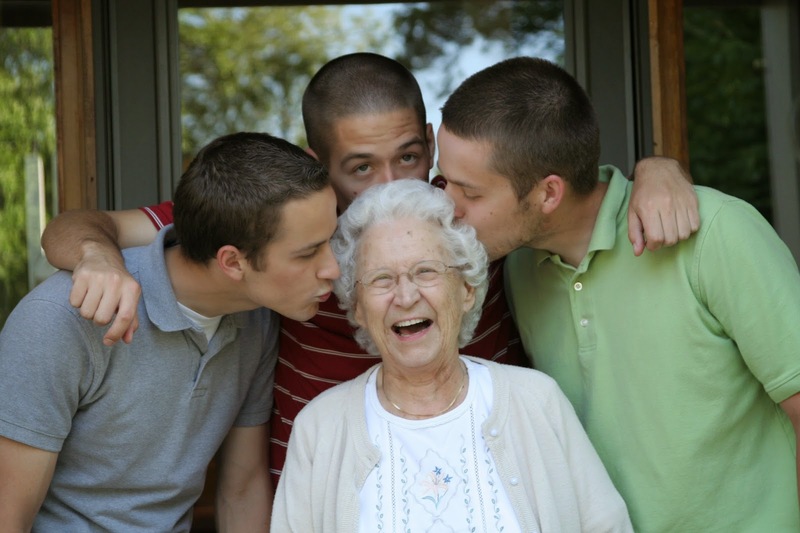 You somehow knew the precious love they would bring to a grandmother's heart. You'd be a great-grandmother now! Not sure you even thought ahead that far. But I am sure of one thing. Through the short 24 years we had, you taught me to laugh at myself, not others. To listen to my children. To love my husband. To care for neighbors and love the unlovable. To try new things. That life is short and a few dirty dishes or dusty shelves mean a lot less than time spent with my children. And in the end, if our time on earth is shorter than we hoped, to have no regrets in how we lived. Thank you for all you taught me. I love you, Mom. Happy birthday.